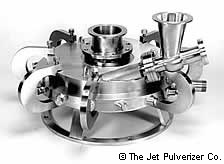 Jet Pulverizer manufactures mills in 11 different sizes. The mill sizes, specified as 1-in. through 42-in., refer to the diameter of the grinding chamber. Material throughput, or feed rate, increases with increasing mill size. Other factors that influence mill-size selection include material characteristics, batch size, and throughput requirements. We also speak of these mills in categories according to their uses: Laboratory, Pilot, or Production. These categories will naturallyoverlap since batch suze can vary widely from one material to the next. Laboratory mills are recommended for process and product development work. Laboratories are able to process just a few grams of a compound in the 1-in. jet mill, the smallest of its kind. The more common, 2-in. and 4-in. jet mills are the true workhorses of the laboratory applications. These mills are small, easy to disassemble and easily cleaned. All lab mills are of all 316SS construction. Sanitary-design lab mills are most popular due to their sanitary fittings and the fact that they are designed for ease of disassembly. Not even hand tools are required. Pilot scale jet mills, typically in sizes from 8-in. to 12-in., bridge the gap between lab and production size mills. Pilot mills can be used indefinitely for light production demands until a process is completed, validated, and ready for a major scale up commitment. They are often used in the cosmetic or the pharmaceutical industry for production of many high-value, low-volume products. Production mills are available in 7 sizes ranging from 15-in. to 42-in. and are available in a number of metal alloys. ceramic linings are most common but all sizes can be fully ceramic lined for greatest wear resistance. Not only do these mills produce at high rates, they are able to input larger raw material particle sizes than conventional mills. It is not unusual to have multiple production mills of the same size running side-by-side producing, for example, different color pigments. Many of the very large production mills are powered by superheated steam to achieve high-velocity grinding and to optimize process efficiency.